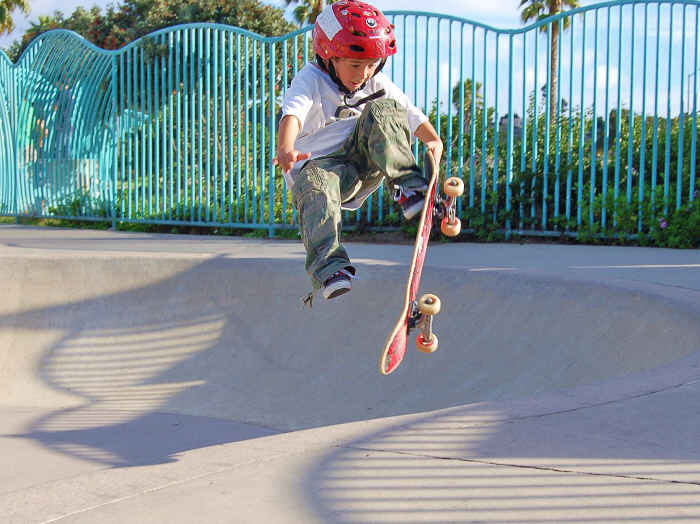 This is Toby Ryan - age 7, photographed by Jim Grant at the OB Surf & Skate Shop benefit for OB Elementary, October 23, 2010, at the Skate Park. What a lift! Bo-Beau Kitchen & Bar is the name given to the restaurant once occupied by Thee Bungalow. The rear exterior has been remodeled to resemble a French chateau patio with a large outdoor pizza oven. A bistro-like al fresco dining area is being created around the oven. Other readers hold their noses when they visit the restrooms at these locations: Ocean Beach lifeguard station, Tourmaline Surf Park in Pacific Beach (there are no stall doors in the ladies room) and the restrooms on the east end of Balboa Park at Casa del Prado. The OB Noodle House on Cable Street was robbed Wednesday night, October 27. The robber came through the backdoor with a gun, and did get away. Police had a photo of the suspect. Anyone with info, call 531-2000. The location of medical marijuana dispensaries should be left up to individual communities rather than have to follow blanket rules set out by the San Diego City Council, according to the city’s community planning groups. At their monthly meeting Tuesday, the groups, comprised of citizens from across the city, voted to make an official recommendation to the council to allow community groups to decide restrictions for medical marijuana shops in their areas. The City Council is mulling a plan that would allow dispensaries in select industrial and commercial zones that have no residential uses. They would also have to be at least 1,000 feet from other dispensaries, parks, youth centers, religious institutions, day care centers and schools. Americans for Safe Access San Diego chapter coordinator Eugene Davidovich said the city is placing a de facto ban on dispensaries due to the stringent nature of the restrictions. If the current rules were approved, areas such as Ocean Beach, La Jolla and Hillcrest would be completely zoned out, despite their planning group representatives saying they are open to having strictly regulated dispensaries in their neighborhoods. Dreamstreet Live in OB Wild and Tame Comedy! Doors open at 7:30 pm with pre-show music by LoveMason followed by the hilarity of L.A. headliner LeeAnn Tooker and local comedians! FREE candy + costume contest with amazing prizes donated by OB businesses. Prizes for sexiest, funniest, scariest, best OB …inspired, animal(istic), couple or group, celebrity and more! 2228 Bacon St., SD $6 cover & no drink minimum 21+. The Ocean Beach Planning Board meets on the First Wednesday of every month at 6:00PM at the Ocean Beach Recreation Center at 4726 Santa Monica Ave. This will be the 3rd of November. For $15, you can sample dishes at over 40 local restaurants, over a 4 hour period, from 5 to 9pm. That’s right, for just $15 you can sample the BEST OB has to offer during the Annual Ocean Beach Restaurant Walk! Begin at Lucy’s Tavern, 4906 Voltaire St., 92107; Hurry, tickets sell out every year, so be sure to get yours! The program by SOHO will include a compelling documentary film by Dan Soderberg about SOHO’s pivotal role is seen in its saving of architectural icons and the importance of future historic preservation. Director Dan Soderberg, a UCLA-trained filmmaker based in San Diego, spent nearly a year interviewing SOHO members and staff for the documentary. He also researched the group’s four decades of achievements through archives, libraries and hundreds of photographs. “There is no one SOHO story. There are many stories and all of them are compelling,” Soderberg said in an interview. “SOHO people tend to devote every ounce of their being to the cause, so it was a challenge to pick the stories to tell.” The meeting is free. November 18, 2010, 7 PM, At the PL Methodist Church, 1994 Sunset Cliffs Blvd. The group “Mom to Madre” donated 25 bags of books to Ocean Beach Elementary recently for their August Book Drive! On September 1 they delivered 25 bags of books for low-income families at Ocean Beach Elementary School. Each bag had 10 books for kids (including one new one) and a cook book for the families. They also gave a donated, complete set of Harry Potter Hardcover novels to the school. Mom to Madre hosted a literacy table at OB Elementary’s Back to School Night on September 30 and donated 26 more books to families. Mom to Madre is a nonprofit 501 (c) (3) corporation offering bilingual parent education to young mothers just starting out who are trying to beat the odds of poverty, illiteracy, and language barriers in San Diego County. Visit http://momtomadre.org or call 619 309-5151 for more information. If your group or business is having an event, go ahead and announce it here in the comments to OB Flashes – that’s what they’re for.